Madina Dia is a UN Volunteer Electoral Advisor with the United Nations Multidimensional Integrated Stabilization Mission in the Central African Republic. She worked with local elections authorities to develop strategies for a peaceful election in December 2015. Following sensitization campaigns and training on the role of elections as the legal means to access power, independent legislative candidates from armed groups registered to serve their country. Bangui, Central African Republic: In 2012, the Central African Republic was plunged into a political and military crisis. The spiral of violence triggered instability and the collapse of the State. The consequences were devastating: people fled their villages, their country, Christians and Muslims were divided, amidst the proliferation of armed groups. Holding elections, despite the support of the international community, was a great challenge. In Bambari, capital of the Ouaka Prefecture, two armed groups, Anti-Balaka (ABLK) and EX-Seleka (X-SLK), coexist. Their frequent confrontations divided the city into two zones - the mainly Muslim left bank and the mainly Christian right bank the Ouaka River. In this context, how does one organize credible, transparent and inclusive elections? The United Nations Multidimensional Integrated Stabilization Mission in the Central African Republic (MINUSCA) set up regional electoral offices in the prefecture. My name is Madina Dia. I am from Senegal and as the UN Volunteer Electoral Advisor, I am responsible for electoral civic education in Oauka. I collaborated with local elections authorities to develop strategies for peaceful elections. This turned out to be a good practice in the last election in December 2015 from which lessons also were learnt. A strong presence of armed groups and the polarization between Christians and Muslims impose constraints on the everyday lives of citizens. The implementation of a strategy of participation or acceptance in the electoral process was one of our successes. So saying, it was particularly important to involve these armed group members in the electoral process, as citizens and not as an unconventional group. The restoration of the rule of law requires the acceptance of these groups as often, as in the case of Ouaka, they constitute a real force of security, economic strength and even a "state" within the state. 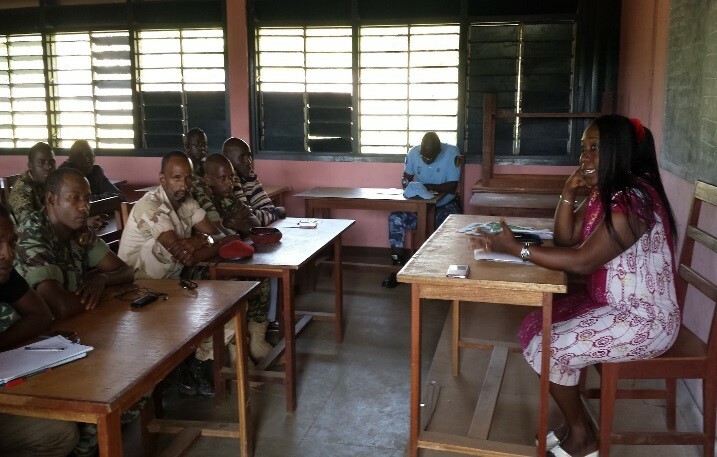 The Bambari Electoral Office held outreach meetings with all armed groups and, despite their status and their rejection of the transitional institutions, a relationship of trust could be established. Information was shared on the role and mandate of the Electoral Division, the local elections authority, and the importance of the elections to provide the country with democratically elected institutions. We also focused on the reconciliation between the state and the population, especially to ensure that elections remain the democratic means of transferring power. On the other hand, training and awareness sessions on the various phases of the elections were held with the leaders of the armed groups and their representatives. As a result, the armed groups participated massively as voters and as candidates in the electoral process. Overall, the results of the electoral process were accepted, and the armed groups saw the elections as a solution to their problems and the crisis. They sensitized their elements on these issues and prioritized the national interest. A non-aggression pact was signed between the armed groups during the electoral process. Citizens, voters and local elections authority members were free to circulate during the election period without being subject to the payment of “taxes” at the illegal barriers. Following such campaigns of sensitization, training, and local communication on the role of the elections as the legal means to access power, independent legislative candidates from armed groups registered to serve their country. On the Ndassima Bambari Axis in Ouaka, the armed groups provided the security of the electoral materials during their transport. The disarmament process precede the elections.